Optoma launches a pair of 4K HDR projectors | What Hi-Fi? 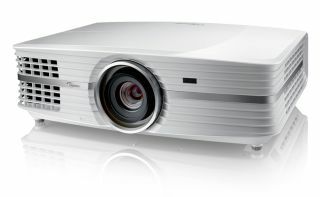 Optoma has announced its first 4K home cinema projectors. The UHD60 (pictured above) and UHD65 both pack 8.3 million pixels and include HDR and HDCP 2.2 copy protection support. So what's the difference between the two? The UHD65 has a higher contrast ratio (a claimed 1,200,000:1, compared to 1,000,000:1), but only 2,200 lumens of brightness, compared to the UHD60's 3,000. The UHD65 also has PureMotion frame interpolation, which claims to eliminate motion blur and judder. Other than that, they're identical, with two HDMI sockets, USB power and an eco mode that sees them operate with less than 25dB of noise. Both have their own built-in 8W speakers, and feature Optoma's Amazing Colour technology, which includes an enhanced colour wheel and multiple modes and settings to choose from. The UHD60 is on sale now, and costs £2,499.99. The UHD65 hits the shops in August, and will set you back £2,999.99.